Photographer(s) Appreciation: Thank you to Bill Higham@Flickr (do visit his photo gallery! ), for this capture of Anisotome procumbens. Bill shared this photograph via the Botany Photo of the Day Flickr Pool. The intriguing and diminutive Anisotome procumbens looks like it came straight from a Dr. Seuss book when photographed with a macro lens! One of its common names, procumbent aciphylla, is explained by its previous placement in the genus Aciphylla. 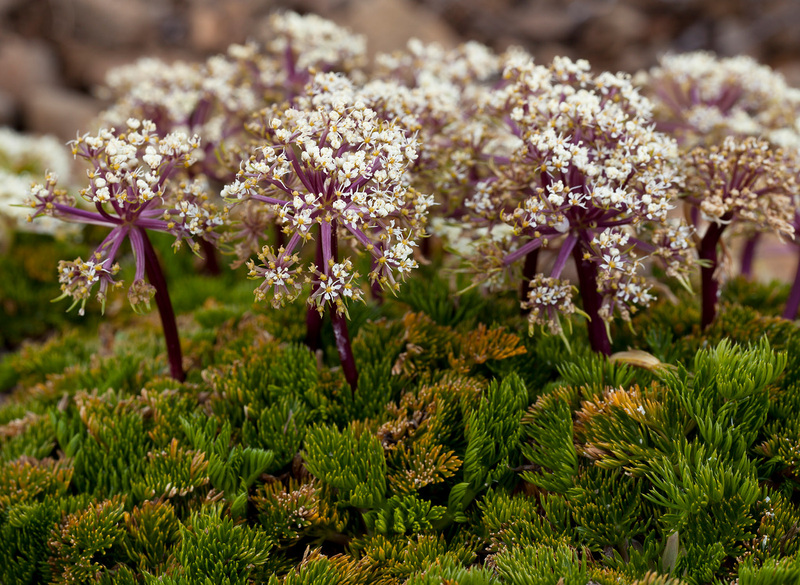 Another of its common names, mountain celery, refers to its presence in high-elevation localities of western and southern Tasmania. Even more specifically, this Tasmanian endemic is primarily found on diabase / dolerite mountains, such as Hartz Peak. Mountain celery is a herbaceous perennial herb. Like many high-elevation plant species, it is capable of withstanding exposure, moisture extremes, and wind. The inflorescences (shown in today’s photograph) are compound umbels of small white flowers that stand above the fine foliage. In its native Tasmania, Anisotome procumbens blooms from January into February, i.e., summer months. Today’s photo may be deceiving, as mountain celery is a small plant; it grows low to the ground, forming clumps and cushions of dense dark green perhaps 10cm (4 in. high). These thick mats can grow to 2m by 2m (6-7ft) across. Thank you again for the information Another new plant I have never heard of before and can research.